If It’s Gluten-Free, Can We Call It Glee? Hungry and desiring new foods, I decided to venture to the UT Market to pick up something to eat. 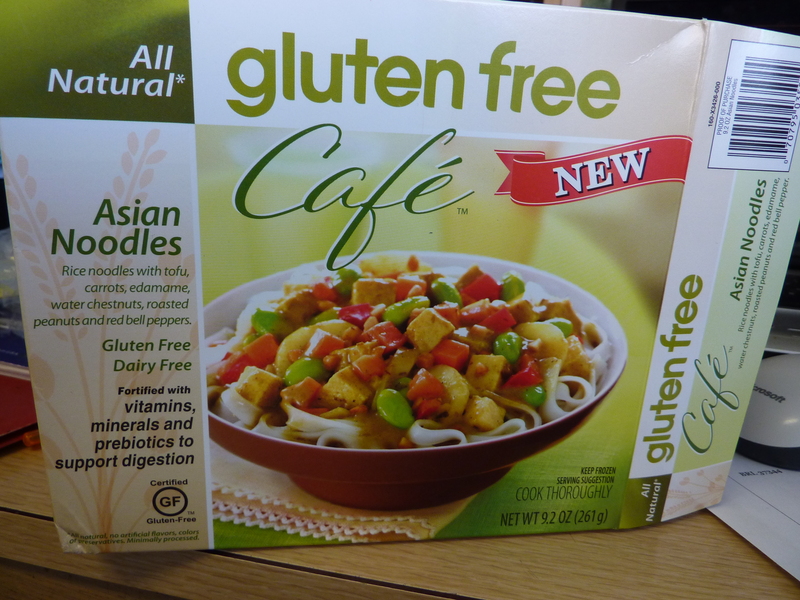 I was feeling a little like Asian noodles and lo and behold I see gluten-free Asian noodles. I may not need to get gluten-free stuff, but it is nice to try out new foods and you might be interested if you need to worry about it. It’s good if you’re craving Asian noodles, but need the gluten-free part, otherwise I would just buck up and go get some Asian noodles outside of UT. Now, onto the food! So in first cooking it, I found the serving to be a bit small. Just right for a small Asian girl like me, but might not be good if you have a big appetite. For flavoring, it was pretty good. The sodium content was acceptable at 720 mg and perfect when you need to be low salt. There was lots of curry, green curry I think, that gave the majority of flavor and spice. 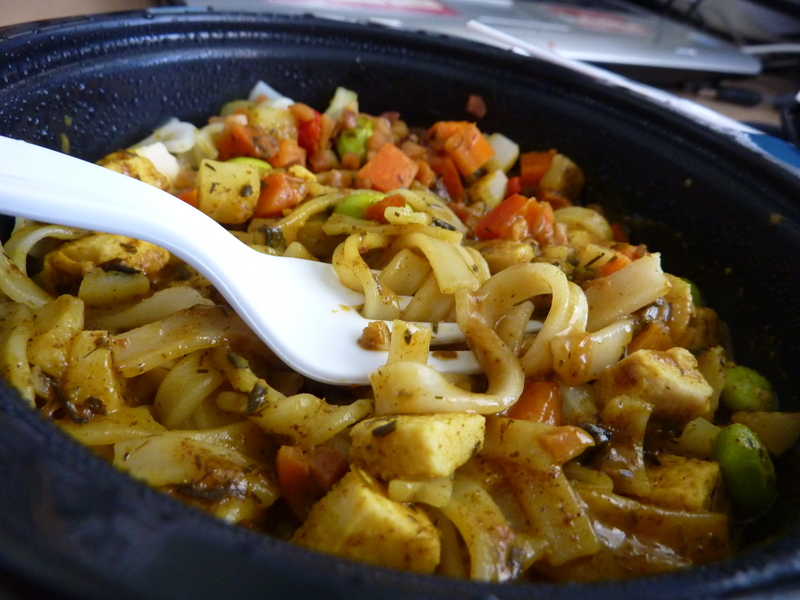 The tofu and rice noodles are a nice touch and certainly gave body to the meal. I like the added crunch of the peanuts and water chestnuts, but a tiny spicy. Overall, I guess what is weird to me is the crazy mix of products. It is edamame from Japan, curry makes me think more of Indian and Thai cuisine, and the overall mix is like a bad Chinese drunken fried noodle. Result: Interesting. You get a 😛 😛 😛 1/2 for being gluten-free and trying to give a tasty meal, even if you are a bit confused. 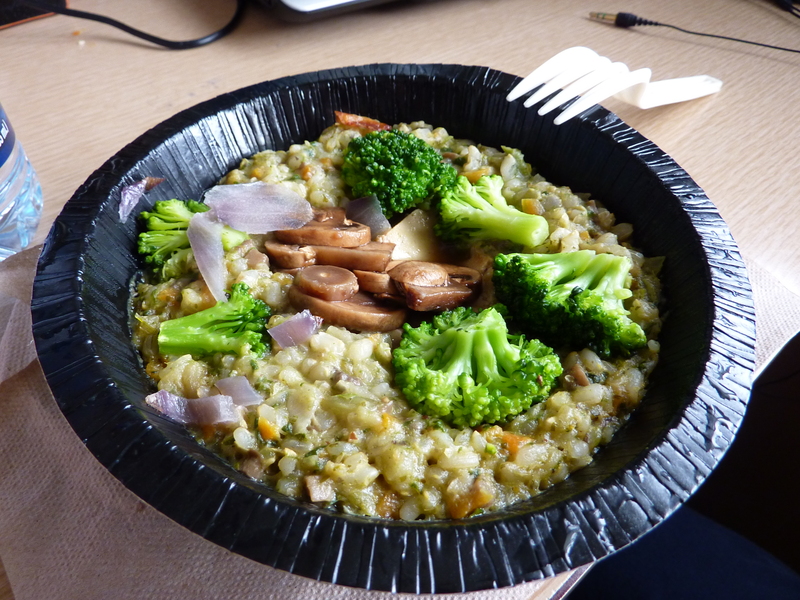 Amy’s Brown Rice and Vegetables is one of the many tasty frozen foods that provides organic, healthful meals for the professional or student on the go. It’s also an easy and yummy meal to eat when you don’t feel like cooking for the night, but don’t want to throw all your diets and food inhibitions away. 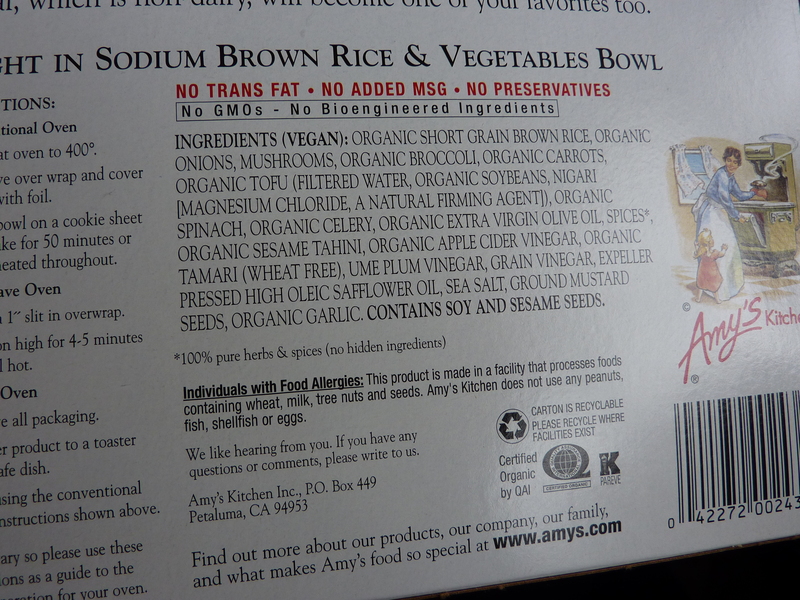 The creators of the company named Amy’s (not the same Amy of Amy’s Ice Cream fame) describe a desire to create tasty, healthful, convenient organic meals for their daughter, Amy, and the entire family. Brown rice and vegetables is a particularly favored meal for any time of the day from breakfast to midnight snack. The amount of food you get in a meal is pretty decent. At first, you think it’s quite small and couldn’t fill you, but I actually think it’s a decent size. If you are really hungry, I would suggest a light dessert afterwards or even two servings of this food. The brown rice puffs up in the stomach and the grainy texture of the rice and broccoli gives a feeling of having eaten quite a bit. Look at all that organic nutritional health! Definitely, what holds the flavor in the meal is the mushrooms and tofu, which soaks up the sauce. What really amazes me is how evenly the food cooks and that the broccoli always comes out perfectly. Cooked just right to keep it soft, but not devoid of all crunch. 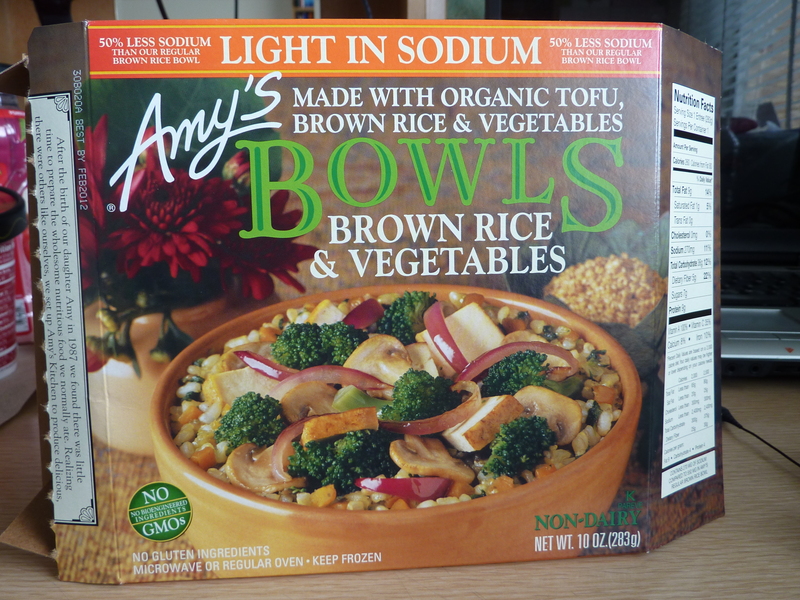 I especially like Amy’s Brown Rice and Vegetables because when I feel like a low-sodium meal, I know I can get a healthful, quick and rather tasty meal right in my freezer. I’ll admit, I personally would prefer something with a lot more flavor. Maybe I am too used to the salty, fatty frozen meals provided to us at the grocery stores, but I have never really been a fan of little spice. The fact that the meal is a frozen meal and must inevitably be a little soggier and less fresh than the real stuff must also translate. However, with some added additions at home, this meal would definitely be awesome to eat and only the expensive price (about the price of five $1 McDonald’s hamburgers) keeps it from being something I stock up on. I think some sautéed onions, maybe some mustard, or even a little bit of fresh rosemary would give this dish that added touch to make it a tasteful meal at any time of the day. Overall, a good meal to eat on the go that is low in sodium (so hard to find these days) and gives you so much of your daily fiber (22%!). Rating: 😛 😛 😛 😛 for low sodium option, healthy, and slight blandness.